The best way to kick off the holidays is by getting your pesky shopping out of the way early. The Holiday Gift List is the best way to organize your shopping this year and stay one step ahead of the crowd. Nothing is more stressful than shopping during the week of the holiday season. With Christmas, Hanukkah, and New Year’s coming up, the stores will be packed and the parking lots will be full. This template helps you get into the right mindset early and put all of your gift ideas for your loved ones in one convenient document. Beat the holiday hustle and bustle this year by downloading this free gift list! Start by downloading the free file below, just click on the link provided. From there, everything you need will be located on one page for your convenience. After typing the current year in the bracketed area, enter the names of everyone you plan to get a gift for under the “Name” column. Then, continue to the “Gift Ideas” section, fill out your ideas for your gift, the store or online URL, the list price, whether you purchased and wrapped the item, and finally if the item has to be shipped. 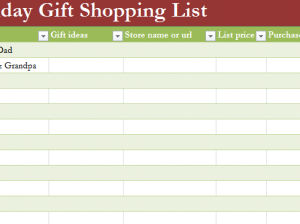 Continue to go down this list and enter all this information for the people you want to buy gifts. When everything is exactly how you want it, simply press the “File” tab and select “Print” from the drop-down menu. Now you have a convenient list of everything you need to make your holidays a truly special occasion! Get your holiday shopping out of the way with this simple template!